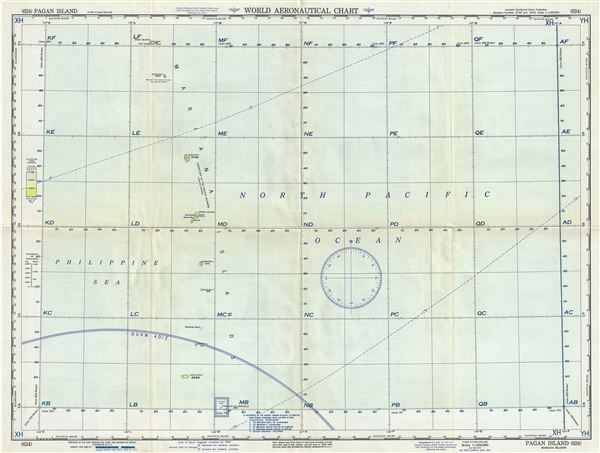 This is a scarce 1951 U.S. Air Force aeronautical chart or map of Pagan Island, part of the Mariana Islands in the Pacific Ocean. It covers from Maug Islands to Farallon de Medinilla in northern Mariana Island chain, including the Maug Islands, Asuncion Island, Agrihan Island, Pagan Island, Alamagan Island, Guguan Island, Sarigan Island, Anatahan Island and Farallon de Medinilla. Verso of this chart features legends and a world aeronautical chart index. This chart was published by the USAF Aeronautical Chart and Information Service, Washington 25, D.C., and was issued as chart no. 624. First issued in 1948, this is the third edition revised to Aug 1955.